Ex-United defender Warren Barton believes that the Magpies have signed a proven “winner” in Miguel Almirón, who sealed his switch to St. James’ Park on Thursday. The Paraguayan international linked up with Newcastle for an undisclosed fee after leaving US outfit Atlanta United, where he helped fire the Five Stripes to MLS Cup glory last year – the American equivalent of a Premier League title – and was twice named in the league’s annual “Best XI”. Prior to joining Atlanta, 24-year-old Almirón lifted trophies with both of his other two clubs – Cerro Porteño in his homeland, and Argentine side Lanús – while he was also named as Paraguay’s Footballer of the Year for 2017. For Barton – a key member of United’s “Entertainers” line-up and now a pundit with FOX Sports in the US – such a track record can only be of benefit to a Magpies side looking to make sure of their Premier League status. The former right back described to nufc.co.uk just how significant a part Almirón has played in Atlanta’s recent successes, and offered an insight into the type of player the Toon Army can look forward to seeing at St. James’ Park. “Almirón is a winner. He did well the season Atlanta got into the play-offs, and obviously they won the MLS Cup last year,” Barton said, speaking from his home in San Diego, California. “He’s won something and that’s important – it’s something he can bring to the table. “Along with (Josef) Martínez – the goalscorer up front, (Michael) Parkhurst – a vastly experienced centre half, and (Brad) Guzan – the ‘keeper, he was one of three or four who played a major part. In the big games, they produced the big moments. They provided the key pass or the key goal, and he was definitely a major player in that. “He’s always been ambitious – even when he first arrived at Atlanta. He’s very loyal to the club but he’s never made it a secret that he wanted to play at the highest level. Speaking to people at their training ground, he wants to be coached and he wants to improve, and working with (ex-Atlanta manager) Tata Martino and now Rafa Benítez, he’s only going to get better and better. He likes to get on the ball and play and he’s not frightened of receiving the ball under a bit of pressure. And I know, from playing at Newcastle, that you are under pressure – whether you like it or not. “I think he can do well at Newcastle. You can rotate him a little bit and he can play on the right or the left, but I think he wants to be in the middle. He’s not like a Keith Gillespie type of winger – someone who will knock the ball forward and run. I think he’ll be ideal for us if we have two holding midfielders who can get the ball to him as quickly as possible and then he can be that link between the midfield and the forward. He’s someone who can drop in a little bit when we haven’t got the ball but when we do have it, we can give it to him and he can try to make things happen. That’s where I see him fitting in. 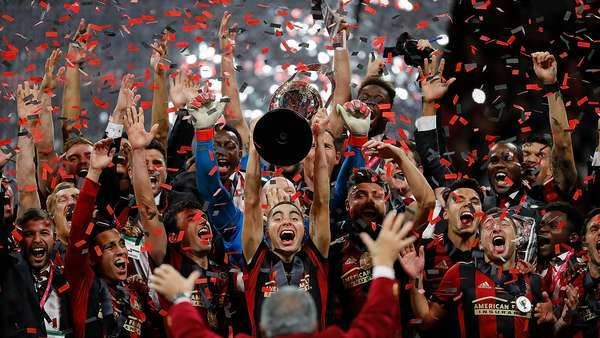 Almirón, centre, lifting the MLS Cup with Atlanta United last month. Having finished his playing career with Dagenham & Redbridge in 2005, Barton has now been based in the US for just over a decade. In the time since, the MLS itself has almost doubled in size. In 2008, only 14 teams took part in the league campaign. With the new season just around the corner, that figure now stands at 24. And, come 2020, two more franchises – one based in Nashville, and David Beckham’s Inter Miami – will have been added to the list. Newcastle’s decision to shell out on a player who largely made his name in the US has, however, already provoked debate, though Barton was keen to offer a defence. “I heard Danny Mills say that he’d never heard of him. To me, it’s quite strange that you’ve never heard of players in other leagues – does that make him a bad player then? Because you don’t know, say, the Argentinian league back to front, does that make it a bad league? It’s very strange and a bit ignorant, really,” Barton said. “The MLS has got room to improve, there’s no doubt about that, but the level of players is getting better. You’ve seen players that have come into the league, do well, and get moves away. I mean, it’s only been going 25 years, so it’s still developing. It had to put itself on the map, in a country where it’s up against three other major sports – four, if you throw ice hockey into it. “Listen, I’m going to be the first to say that it’s a jump up from the MLS to the Premier League. But we’ve been talking about Christian Pulisic leaving the Bundesliga to go to the Premier League (to join Chelsea). That’s a jump up, but are you saying that the Bundesliga’s not a good league? I think we have to be careful that we don’t get too cocooned in thinking: ‘Oh, because we’ve never heard of him and he doesn’t play in the Premier League, he’s not a good player.’ Well, with other players that have come into the league, people might have said: ‘Who are they?’ Remember Patrick Vieira? Thierry Henry? And then they go and take the Premier League by storm. “I think it is good business. I think people will start looking at the MLS and look at players and think: ‘Yeah, we can get them a little bit cheaper than what we might have to pay in Spain, Germany or Belgium.’ This is a market that’s a bit untapped. You’ve seen a young kid, Tyler Adams, move to Red Bull Leipzig recently, and he’s hit the ground running. Atlanta United's Mercedes-Benz Stadium, pictured during December's MLS Cup game against Portland Timbers. Almirón’s previous club only joined the MLS in 2017, having previously represented the largest metropolitan area in the US without a franchise of their own. Since, however, their progress has been meteoric. 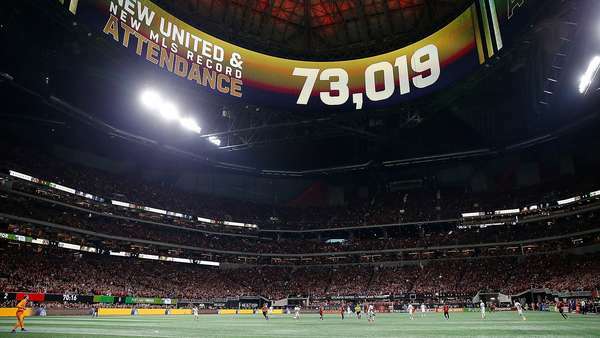 In addition to their success on the pitch, off it, attendance figures have been nothing short of staggering. Last season, the average turnout at the $1.5 billion Mercedes-Benz Stadium – a venue the Five Stripes share with the city’s NFL outfit, the Atlanta Falcons – stood at 53,002. For December’s MLS Cup decider against Portland Timbers, a whopping 73,019 packed in to see Martino’s side secure their first piece of major silverware in style. That day, there were more people watching on than had been present at the last four Super Bowls – historically, of course, the flagship event in the American sporting calendar. Though quick to admit that playing Premier League football at St. James’ Park – as well as the likes of Anfield, Old Trafford and the Etihad Stadium – will prove an altogether different experience, Barton is confident that Almirón’s time with the MLS’ best supported outfit will have done much to prepare him for the task ahead. “Though I love Atlanta and they have a great fanbase, St. James’ is a different animal – that’s why people love it up there. But he’s not coming from a Columbus Crew or a Portland, where there’s a good fanbase but there’s only 18 or 19,000 of them, he’s coming from Atlanta. When you arrive at the airport there, they have merchandise from Atlanta’s football team – it’s not just about the NFL team or the basketball team. They’ve got a big presence in the city, and come matchday, the stadium’s very much a football stadium,” Barton said. “Walking down the street in Atlanta, someone will have recognised him. It’s like all the things that I had at Newcastle that were different to playing for Wimbledon. Walking along the street in London, nobody will recognise you, but when you walk down Grey Street everyone wants a bit of your time. He’ll be quite used to that. "He’s always been ambitious – even when he first arrived at Atlanta. He’s very loyal to the club but he’s never made it a secret that he wanted to play at the highest level."